This afternoon I found myself in an unlikely place: the local library. Libraries aren’t totally foreign to me, having spent a good portion of my college years holed up in the corner of the reference section, prepping for the next exam. But in the age of electronic media, a trip to the library has the same frequency as a holiday visit to a distant relative. I was picking up some CDs and decided to see what the library had to offer in the way of fly fishing books. 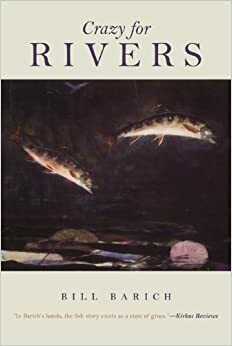 I found the usual suspects: Rosenbauer, Gierach, Maclean, along with a string of how-to books on fly tying, streamer fishing and reading waters. The book contains stories about fishing trips that I either aspire to take or remind me of my own experiences. Barich is a truly enjoyable writer. If you are looking for a quick read, pick up or check out a copy of Crazy for Rivers. Enjoy! Thanks for the tip. I’ll definitely check it out! Nice. I’m ashamed to admit I don’t read books much, but I’ll put this on the short list for my next flight. I can handle 80 pages.